I don’t have aspirations to be 18 again or anything like that. I like my age. I want to be my age, but I want to maintain a good healthy lifestyle. That’s my goal. In my fifties I played squash, but soon found my muscles were becoming grounded one way. I wasn’t as flexible as I used to be and that concerned me. Working at the VA as a psychologist, I also felt the need to be better prepared when situations occurred so that I could safely handle the patients. My journey began fifteen years ago when I signed up with Master Gorino. I’m currently a 4th degree black belt. In the last several years I’ve tried to appreciate what I can do and never stop doing it. Why do you like Tae Kwon-Do? 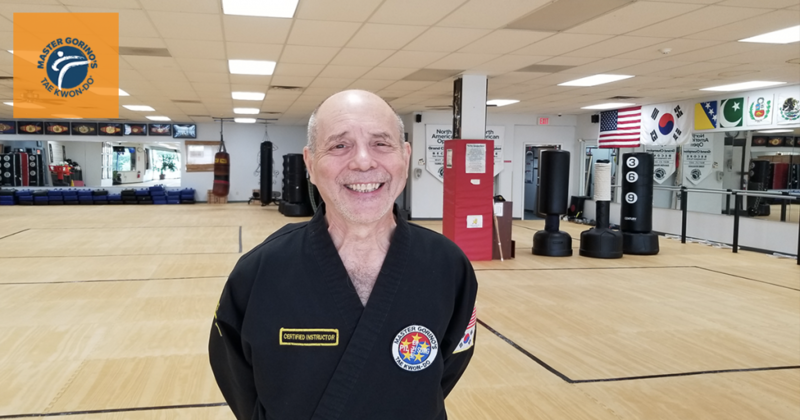 What’s wonderful about studying Tae Kwon-Do with Master Gorino are the incredible allowances for doing the best you can and not necessarily having to matchup with people who might be more flexible than you. It’s not about who can kick the highest above your head. You learn the basics and keep at it while taking care of your body and making sure you’re ready for class. What I really love is the fact you can make a mistake and it’s not the end of the world. You can make mistakes, and you will make mistakes. Life is about adapting and adjusting from your mistakes. To improve yourself without wounding your ego. It’s a tough learning experience, but here you’re okay. That’s the ethos that we have here. We have all sorts of ages and backgrounds. It’s a very diverse and accepting dojang, and I just love that about this place. There’s a vast array that can occur here as far as physicality, ethical values, relating to other people, self-discipline, honesty, accountability for what you do, and all without severe judgment. It has the combinations of traditional Tae Kwon-Do that I respect, plus the warmth of a family. I rue the day I didn’t join up earlier with my son and daughter. There are times I’m envious of the families that come in here. They respect one another and all learn together, even when the little ones teach the daddies and the mommies. The atmosphere couldn’t be more positive. I love what I’m doing at my age. I’m in great shape, my memory is clear, and I continue to learn new things along the way.